© 2018 Scratchu.com Samsara | Shawn Ku, Christy Chung, Neelesha Barthel, Lhakpa Tsering, Tenzin Tashi, Jamayang Jinpa, Sherab Sangey, Kelsang Tashi, Tsepak Tsangpo, Norbu Dolma, Sonam Gyatso, Jampa Kalsang Tamang - Samsara (2001) | Tibetan Movie | 7.8/10 | Synopsis : A spiritual love-story set in the majestic landscape of Ladakh, Himalayas. 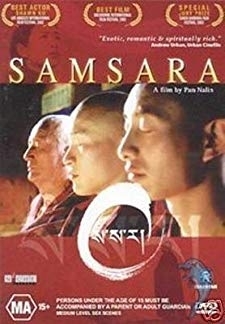 Samsara is a quest; one mans struggle to find spiritual Enlightenment by renouncing the world. And one womans ... ... Watch Online!! !